which was to be hosted by Lismore City in December of the following year. The new Committee was largely that which so successfully staged that memorable Convention. The irrepressible Davey Rankin was the main protagonist in securing Lismore as the 60th Convention venue. Convention Committee July 19, 2005. Standing l to r: Pietro Fine, Davey Rankin, John Bancroft (Lismore City Council), Michael Bird. Seated l to r: Syd Sycamore, Carole Sycamore, Joan Heaton, Doug Heaton, John Flynn. Absent from photo: Sue Brennan, Jim Klages. 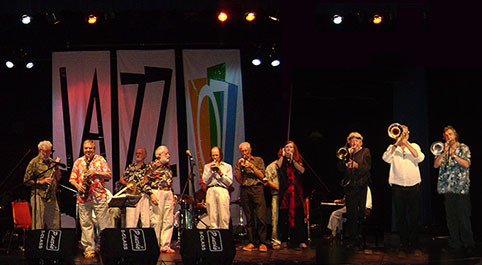 The first official Jazz Club ‘fundraiser’ was held in late Spring 2004 at the then Lismore RSL Club (behind Heritage Park) and featured a few local bands and a jam session or two. Over the next 6 months, regular gigs were being held at number of venues around Lismore and the Northern Rivers to raise the much-needed funds for the staging of the Convention. Lismore City Hall, The Frog and Peach Restaurant at Wyrallah, Ballina Seagulls Club, Lismore Heights Bowls Club and the Winsome Hotel in North Lismore all hosted jazz events. Lots of regular and pick-up bands, large and small. A huge debt is owed to those singers and musicians who gave generously of their time to play for more or less ‘beer money’ during those halcyon days. By April 2005 we had found our regular ‘Sunday Arvo Jazz’ home at the charming Lismore City Bowls Club. The support of the management, staff and members of the City Bowlo over the last decade is priceless. during the 60th Australian Jazz Convention in December 2005. During 2005 and 2006 LJC also held special cabaret nights in the Fountain Room at Lismore City Hall. These were ticketed events billed as the Jazz Supper Club with a fully licensed bar and patrons encouraged to bring their own finger food. The Supper Club featured artists such as the legendary Bob Barnard, the George Washingmachine String Band, and ensembles fronted by Elizabeth Lord, Sharny Russell and Marilane de Mello. In November 2006, the Club staged an ambitious cabaret concert in the City Hall auditorium. and featured Opera Australia’s Kate Sheppeard & Juan Jackson supported by the Jack Thorncraft Trio. Lismore Jazz Club had come of age. l: Lachie Thompson and Bob Barnard impressing at the Jazz Supper Club. r: For one memorable night, Lismore could boast its own 'Carnegie Hall'. Outside of the normal programme, LJC continued to stage fundraising events through 2007 and 2008 – restaurant nights, golf days and river cruises – all to maintain a healthy bank balance so as to be able to attract the best jazz and continue to pay performers professional rates. 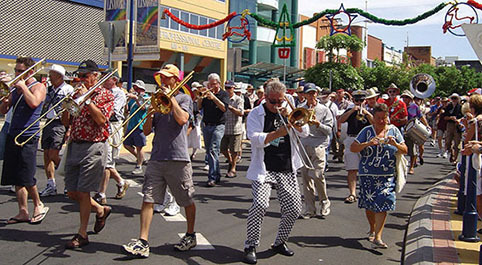 In 2008 Lismore again welcomed 400 musicians and delegates when the city played host for the 63rd Australian Jazz Convention. 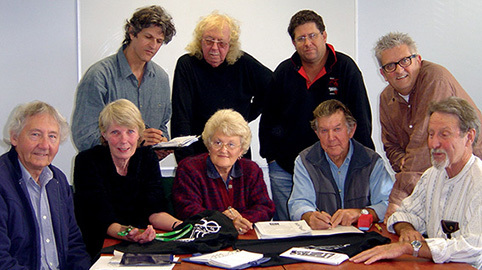 Lismore City Council (Events Unit) hosted and funded the Convention while LJC organised all promotional and the session programming across 6 venues. Another fantastic week of jazz and partying. New Year's Eve jam session at City Hall – a great end to the 63rd Convention. to a 'sold out' Lismore City Hall in March 2010 while on his Australian tour. from Switzerland during their extensive tour of a jazz-loving Australia. We are truly blessed. Lulo Reinhardt Quintet playing to a packed house at Lismore City Hall. all promotion and staging of gigs is on a voluntary basis from a dedicated committee. Patrons are encouraged to become Members (only $20 a year) to not only receive discounted entry to all gigs but more importantly, to keep the coffers filled so we can continue to stage the very best live jazz!